Looking to invest in real estate? South Mountain Investments has a successful track record in renovating for resale. Check out how we added value to our properties below. This unique 5 bedroom, 3 1/2 bath mid-century modern features open concept layout, floor to ceiling windows, finished basement, huge backyard with large deck & 2-car garage. What really got us excited about this property is its unique modern offering in the historic Montrose Park section of town which is walkable to town and train. We teamed up with Krista at Clear Space Home Renovation & Design Consulting to bring a California cool meets Suburban NJ vibe. We focused our time and money in transforming the front of the house as well as creating an open concept living room/dining room/kitchen, a master suite with double closets, double vanity and walk-in shower and opening up the cramped 2nd floor to have two bedrooms, a full bath and a fun hangout loft space. Check out the full house virtual tour at www.201turrellave.com. When we purchased this home, it was an old fashioned 4 bedroom, 1 ½ bath house. It was in rough shape but it had the right walk-to-train location, a huge double lot and the potential to add more livable square footage. Together, through detailed planning with Krista at Clear Space Home Renovation & Design Consulting, we turned this fixer-upper into a 5 bedroom, 3 ½ bath gem with a new open concept gourmet kitchen, a new family addition off the side porch, a powder bath, mudroom, walk-in pantry, master suite with walk-in shower and walk-in closet as well as a finished 3rd floor with two bedrooms and a full bath. Take a virtual tour at www.114prospectpl.com. We turned this outdated 3 bedroom, 1 full bath colonial into an adorable 4 bedroom, 2 full bath charmer. We knew we needed to add more livable square footage to add value. 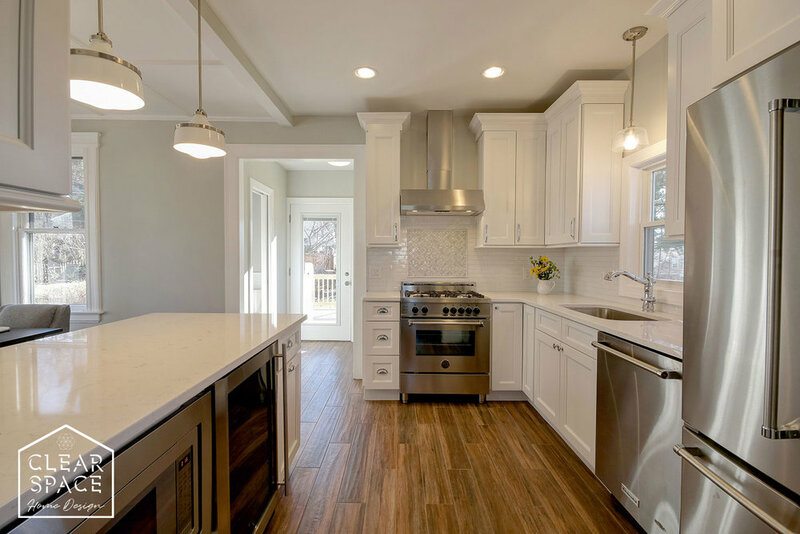 In addition to renovating the kitchen and main bathroom, we opened up the kitchen/dining room, added a mudroom, updated the sun porch, added a master bath and master closets, finished the third floor for a 4th bedroom, added a patio and semi-finished the basement. When we purchased this modest-sized home, it had 6 small bedrooms and only one full bath! We decided to combine the 3 small bedrooms on the 3rd floor to make an amazing master suite with bed area, lounge, walk-in closet and full bath with walk-in shower. We also opened up the kitchen/dining room, added a powder bath and turned an extra large hallway into a really cool mudroom. The house is located on up and coming block (think Brooklyn West). Krista at Clear Space gave this home a hip, modern vibe. We sold this 4 bedroom, 2 1/2 bath home before it even hit the market to an end user who saw our first flip at 194 Village Rd and liked what we did there. When we purchased this home in 2015, it was a 3 bedroom, 1 ½ bath house in need of repair. It was located in an area of town where values were starting to rise quickly. We turned this fixer-upper into a 4 bedroom, 2 ½ bath house and added a new large deck, a semi-finished basement, a master bathroom and a 3rd floor bedroom.